Hygiene and infection control is our number one priority at Seymour Dental. After the patient is escorted to the dental chair they are asked to rinse. 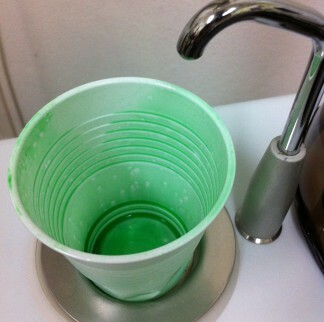 The cup is sprayed with a fresh mint spray. The kids say it looks as if the “Shrek spat in it”; rest assured it is just mint flavoured mouth rinse sprayed into the cup. It is then specifically filled in front of the patient to show them it is not “pre-loved”. The instruments are then unwrapped in front of the patient and made ready for the dentist to use. We are more than happy to answer any questions about hygiene or anything else troubling our patients, and reassure them that privacy is a top priority. The autoclave bags which the instruments have been sterilised in have a unique barcode which is then scanned and recorded under the patients notes, to identify the nurse’s number who sterilised them but also what was used on the patient on the day for tracking purposes. The autoclave is serviced every 6 months and we receive a certificate, which shows that it complies with the standards that are strictly required in Australia. A qualified Technician comes to our premises and runs various tests to see the machine reaches the temperature required to annihilate all possible bacteria and viruses. We also have it calibrated every 6 months. 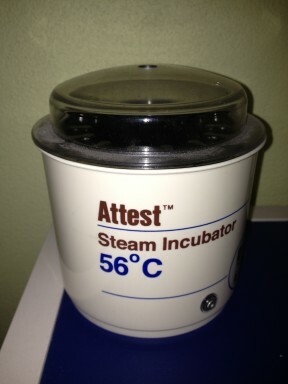 This entails the technician running the autoclave on three different cycles with little vials to test if the required temperature is reached. 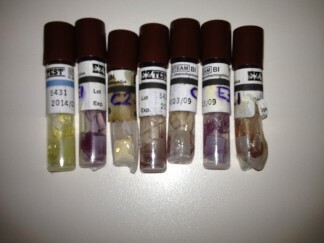 The vials contain bacteria spores (or “seeds”), which are very resistant. A control vial that was not put in the autoclave, together with the other vials, is then incubated for 24hrs at 56 degrees C. Yellow colour means bacteria have grown in the control vial. Purple means no growth and confirms sterilisation.